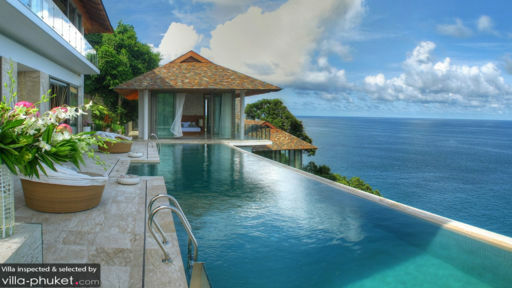 Villa Minh meaning ‘liberty’ is a six-bedroom luxury villa in Kamala beach, Phuket with a private beach access surrounded by luscious greenery and the stunning Arabian Sea right at your doorstep. The villa itself has been designed in a traditional manner with wall tapestries and Asian artwork that graces the walls of the bedrooms and the living areas. Floor-to-ceiling glass walls provide substantial views of the ocean and rich vegetation so you can make the most of your holiday. With six bedrooms, Villa Minh is well-suited for large parties of guests as well, especially if you’re travelling with kids since two of the bedrooms share their facilities. Four bedrooms are suites in their own right with king-sized beds, stunning vista through glass walls, and elegant furnishings with wooden flooring. The walls are made regal with a wall feature and the natural lighting makes it inviting and familiar. The fifth bedroom is furnished with two queen-sized beds, whereas the last bedroom also has a queen-sized bed. While the four suites have en-suite bathrooms, one with a glass exteriors and a freestanding bathtub, the fifth and sixth bedroom have a common bathroom. A stunning vista of the Arabian Sea greets you as step outdoors at Villa Minh. There is the 17.5-metre swimming pool with an infinity edge so you can swim around as if right in the ocean for an amazing experience. Rattan, circular daybeds are found on the pool deck for relaxing after a rejuvenating swim or a few rigorous laps. The best part there is a poolside bar for guests, where they can get a few drinks, especially in the evenings for a nice poolside BBQ with friends and family. Clear-blue skies, green foliage, and the dazzling ocean are right at your doorstep! Right beside the swimming pool is the media or recreation room of Villa Minh which has been done up in all-wood interiors as well as paneled walls for surround sound quality. The flat-screen TV, projector screen, and DVD player are all ingredients for movie marathons all night! There is a billiards table and bookshelves lined with intriguing reads for you to occupy your time and have fun. The living area features an entire wall made out of glass that overlooks the ocean, to make you feel like you’re standing right on top of it. There are comfortable sofas in the room that is decorated with traditional art and the ceiling is also traditional and high-soaring. A square-dining table with seating for eight people at a time, and the view against which the dining table is set only furthers the magical culinary experience. The stainless steel, modern kitchen is fully-equipped with the best of amenities and appliances including a microwave/oven, cooker top, refrigerator, as well as a breakfast bar with chairs. The villa staff is friendly and kind towards their guests ensuring they have everything they need and require for their stay. Housekeeping, pool and garden maintenance, security etc. are all provided by the staff. Services like laundry, in-house massages, meal preparations etc. are charged extra. 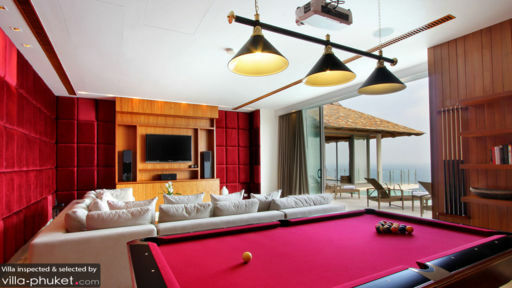 The villa is located in one of the quieter and laidback regions of Phuket that is near Kamala beach and Laem Singh beach. The beaches are excellent for water sports, sunbathing, and to enjoy a relaxing time with loved ones. Laem Singh beach also offers a chance to interact with the beautiful marine life. There are Thai restaurants and beach clubs that you must try out! We spent 3 nights here with my friends. This is the 3rd time I came back to Phuket and used similar services this year. Nop and his team was very nice, polite, friendly, and helpful. Thank you for helping us with our wedding and giving us the best memories of our lives. We all had a wonderful experience thanks to the amazing hospitality shown by Nop and his crew! The food, service, and villa (I’ve fallen 9in love with the view since our first day!) was perfect and I hope to visit again in the future for our anniversary. With Love, Joanne & Jeff. It was the best vacation ever, I wanna stay here forever. The food, staff, and beautiful villa were all perfect, even beyond my expectation. Definitely, I will come back here for another vacation. Thank you, Villa Minh Team. We have had an amazing time at this stunning villa. Nop has made sure all details were perfect from birthday cakes to restaurant recommendations to emergency doctor’s visits!! The food was amazing…everyone was just lovely! a wonderful holiday!! Nothing was left to chance, warm caring service, in our schedule. They anticipated our every need and desire. 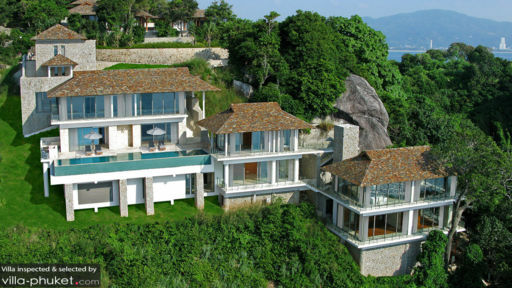 The villa is beautifully designed for privacy and comfort with amazing views. Food was delicious and varied. The beds were way to firm for our preference, but we go used to that.